Giveaways & Sweepstakes is a manually updated sweepstakes directory that scours the web daily to find giveaways and sweepstakes with huge prizes. The Giveaways & Sweepstakes directory is slightly different than most directories in that they manually go out every day and find new promotions to add to the site rather than relying primarily on sweepstakes administrators submitting sweepstakes to them. This means that the sweepstakes on this directory tend to include huge prizes from a wide variety of brands, websites and companies. There are also some smaller promotions listed here on occasion as well if the prize is deemed interesting. One of the best attributes of Giveaways and Sweepstakes is the clean and easy to navigate layout, making it simple and fun to browse through the prizes that are listed. The directory also allows you to browse by frequency of entry (daily, one-time only, unlimited), regions where the sweepstakes are open and the month that the sweepstakes is ending so that visitors can prioritize which sweepstakes to enter. 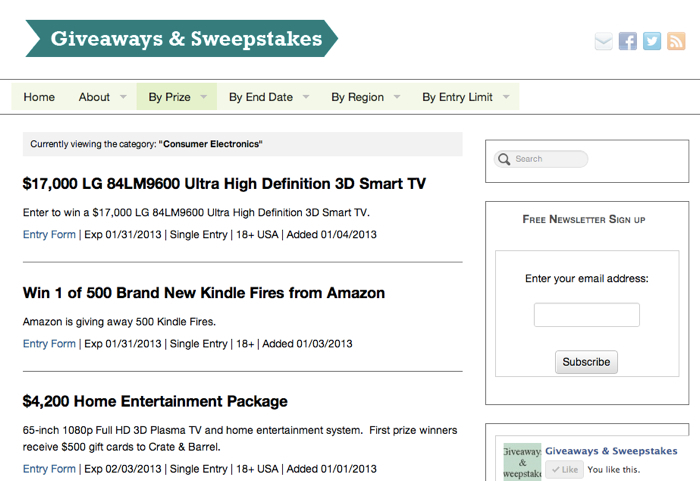 Submitting a promotion to Giveaways and Sweepstakes is a bit more expensive than other directories, at $25. However, their daily email newsletter reaches over 15,000 people and each sweepstakes is said to average over 1,000 entrants so this may be an ideal spot to promote any larger sweepstakes that are being run.